He was jazz’s first hipster. He performed in sunglasses and coined and popularized phrases like “that’s cool” and “you dig?” He always wore a suit and his trademark porkpie hat. He influenced everyone from B. B. King to Stan Getz to Allen Ginsberg, creating a lyrical style of playing that forever changed the sound of the tenor saxophone. 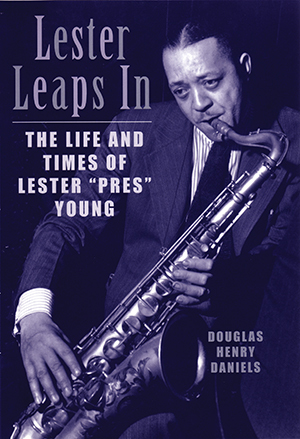 In this groundbreaking biography of Lester Young (1909-1959), historian Douglas Daniels brings to life the man and his world, and corrects a number of misconceptions. Even though others have identified Young as a Kansas City musician, Daniels traces his roots to the blues of Louisiana and his early years traveling with his father’s band and the legendary Oklahoma City Blue Devils. Later we see the jazz culture of New York in the early 1940s, when Young was launched to national and international fame with the Count Basie Orchestra and began to accompany his close friend Billie Holiday. After a year spent in an Army prison on a conviction for marijuana use, Young made changes in his music but never lost his sensitivity or soul. “A groundbreaking account of one of the great figures in twentieth-century music and the rich cultural heritage that made a Lester Young and this wonderful art possible.” -Robin D. G. Kelley, author of Freedom Dreams and Yo’ Mama’s Disfunktional!